2000 saw a new player enter the wooden coaster business: Vekoma. 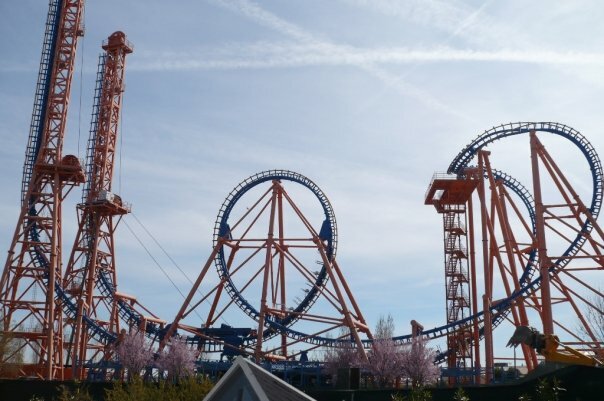 That year, as a part of a major project to transform Walibi Flevo (Flevoland, Netherlands) into Six Flags Holland, Vekoma sold 5 new attractions to Six Flags for that park. One was the classic Boomerang, the other a rare “LSM Coaster” near the park entrance, a giant wheel as the center piece of the park, a Merlin themed Mad House haunted swing attraction and finally, the ride that concern us: Robin Hood. 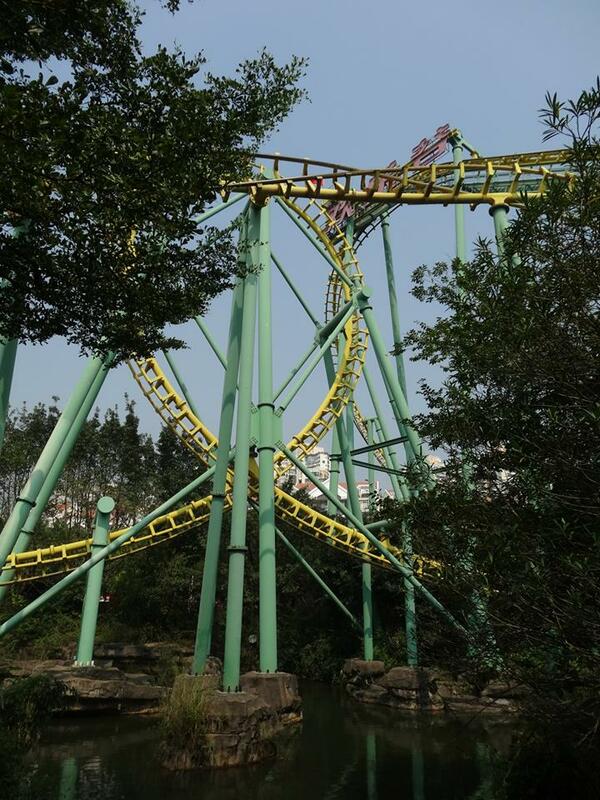 Robin Hood was Vekoma first wooden coaster first project and for this one, retained a few experienced partners to see this project successfully through. Design was done by the Stand Company out of Cincinnati, OH. Dennis Starkey is a successful wooden coaster designed and the design retained for the Dutch ride was a unique U shaped out and back design. 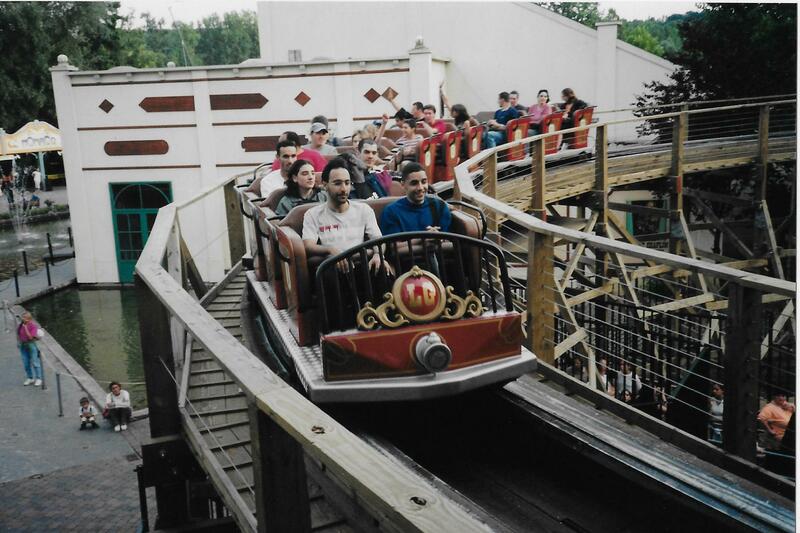 For construction, Robin Hood and Thunder Coaster were constructed by Martin & Vleminckx, who have been since 1985 masters at building wooden coasters in the most unusual locations. 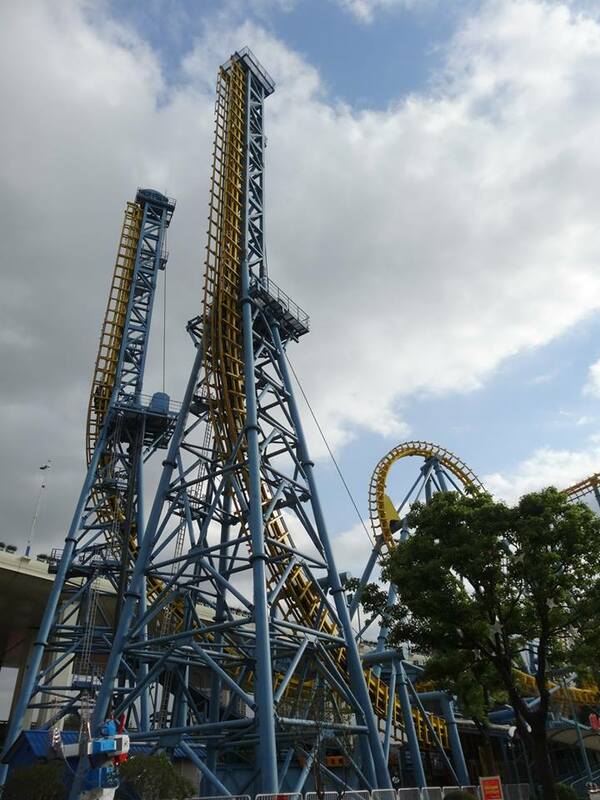 Vekoma sold the ride and responsible for delivering the project while providing the rolling stock, brakes, chain lift and control system. 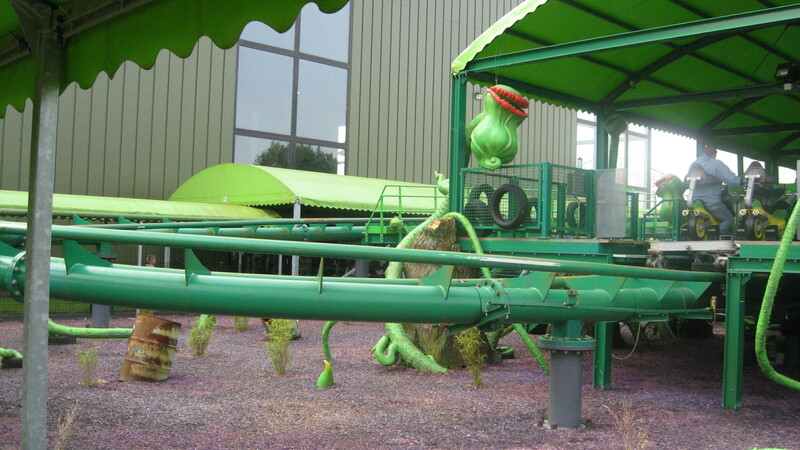 In 2001, The Stand Company designed the Loup-Garou at Six Flags Belgium, which is now Walibi Belgium in Wavre. 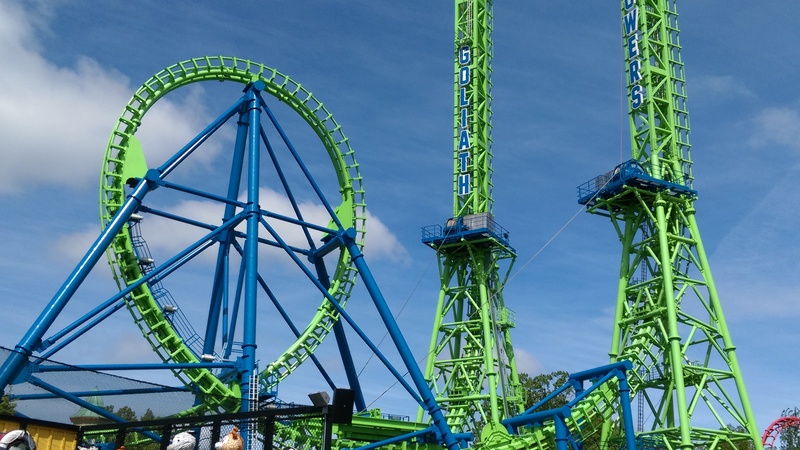 The third ride is the Thunder Coaster at Tusenfryd, near Oslo, Norway. It has a much different profile, with the design work done by Allott & Lomax from the United Kingdom. 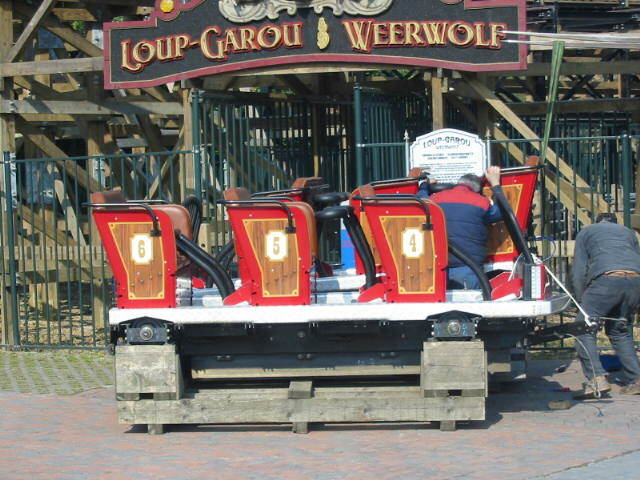 The Vekoma wooden coaster train used on Loup-Garou. It has a 3 bench configuration and used a ratcheting individual lap bar restraint. Here is the train during its initial installation in 2001. Notice the oval donut shaped lap bar. No additional seat belts were necessary with this restraint. The trains were beautifully decorated in an art-deco style that reminds us of the Roaring 20’s era roller coasters. This picture show a close-up of the very padded and comfortable seats and the elongated donut restraint. The Loup-Garou train pulling into the station. 2001 was an interesting year for Vekoma, with three major new products being introduced and the Flying Dutchman evolving for the first time. The first new model was the Giant Inverted Boomerang. 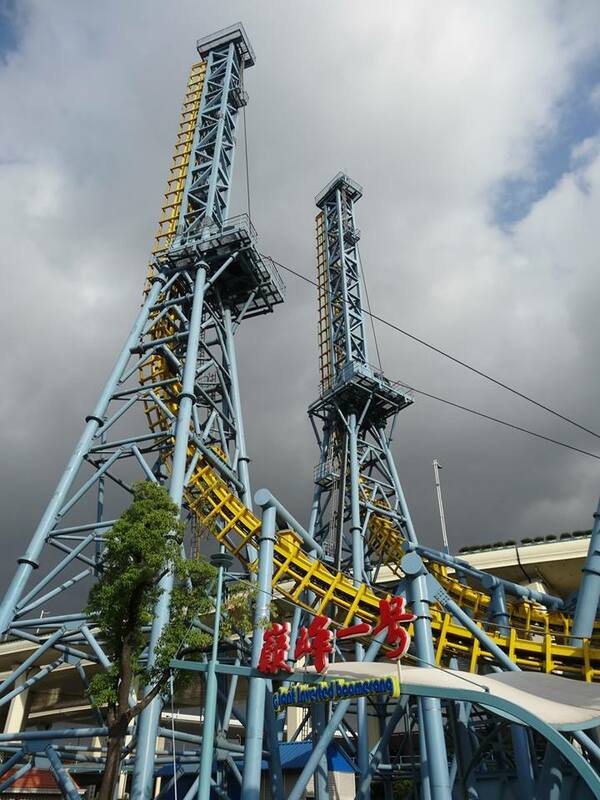 This was a new version of the Boomerang, where an inverted coaster train would hang under the Vekoma high load double tube track and both lifts would be vertical. Each lift are 192 feet tall and the train reach the 177 feet level on both. The other layout difference is that the 110 feet tall Cobra Roll double inversion is angled so that the 102 feet tall vertical loop is over the station, so the layout crosses over itself. The train reaches 65 mph when it runs through the station after being dropped. Model of the Giant Inverted Boomerang, presented at IAAPA Attraction Expo 2003. 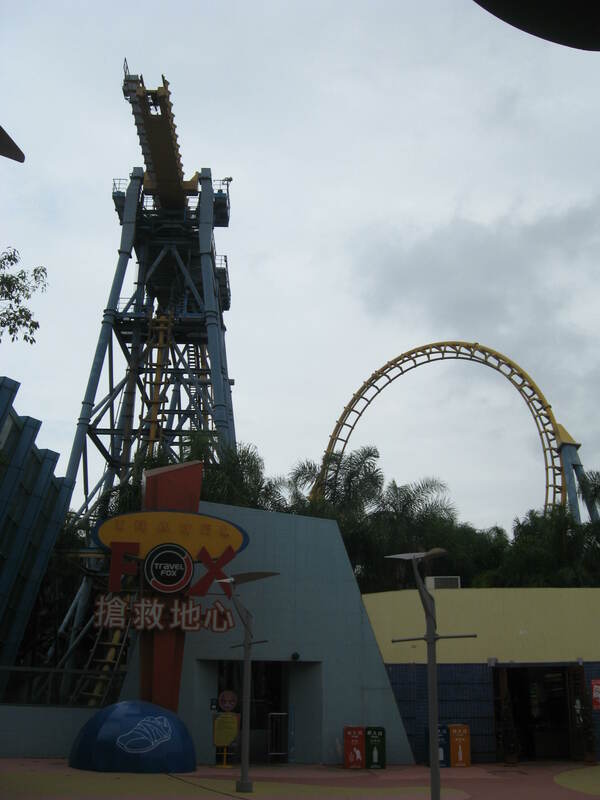 In this picture of the Déjà Vu at Six Flags Magic Mountain shot in 2005, you can see the long serie of brakes that are used when the ride detect the train does not have enough speed to clear the Cobra Roll. By slowing it down there, it allows the train to just roll back into the station for a quicker guest evacuation and ride reset. This is the huge station track of Déjà Vu at Six Flags Magic Mountain. Why is it so big? Because the top track is for the catch car that move and stop the train in the station and spikes. The evacuation staircase in case a train get stuck in the Cobra Roll. Like the two other previous pictures, this was shot in 2005 at Six Flags Magic Mountain. The vertical spikes required a unique solution for pulling and grabbing the train. 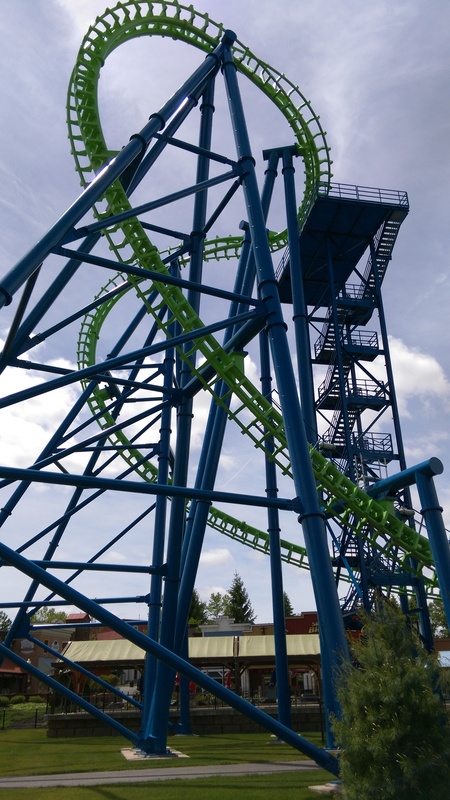 Vekoma went with a design where a catch car runs on a second track and it use two steel jaws in a V shape that grab the train braking fins in the station, when it goes up the second spike and when it runs back up the first spike. Unfortunately, it leads to huge difficulties at first, since the timing for the second spike had to be perfect and a miscatch meant the train would miss the jaw. It would then go back down and the pneumatic pinch brakes would stop it at the bottom of the hill. Maintenance would need to come release the riders and then manually lower the catch car so it can attach itself properly. 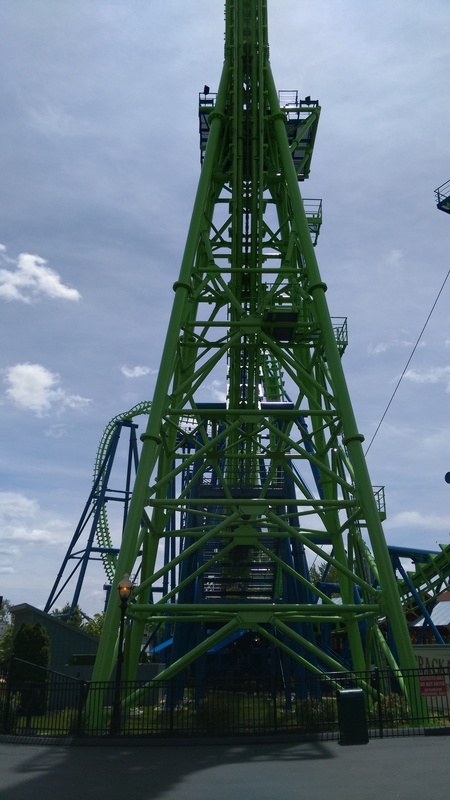 Side view of the “Goliath” at Six Flags New England (Agawam, MA). Notice the huge vertical loop and giant spikes. 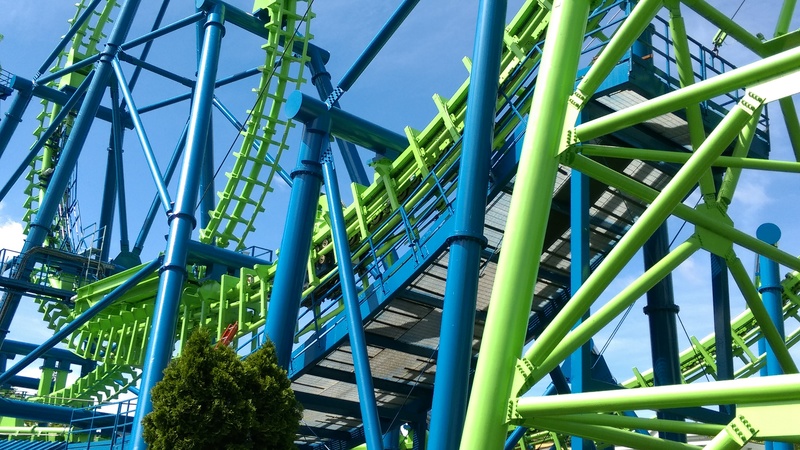 Goliath is the ex Six Flags Magic Mountain Déjà Vu and it came in 2012 to its new home. The back of the second spike. Notice that the track has a different shape to allow the catch car to slide up and down. You can see the catch car on the right and this platform was added to make train evacuation a very quick process. In the case of a miscatch, the train will go back down and be stopped in this area by pneumatic pinch brakes. A close up of the platform. The ride giant Cobra Roll and the evacuation platform and staircase. The huge vertical spikes. This is a 2011 installation at Jin Jiang Action (Shanghai, China). The huge Cobra Roll. Unlike the Six Flags ones, the evacuation platform was not ordered for this installation. The Vertical Loop, which is placed over the loading station. The four pictures above appears courtesy of Flex. Both Six Flags, who had ordered the first 4 models and Vekoma worked hard to figure out the complicated software, but eventually it worked out ok and the ride now has an acceptable uptime rate at Six Flags New England (that got the Six Flags Magic Mountain installation), Parque Warner Madrid and Silverwood in Coeur D’Alene, ID (the Six Flags Great America model). 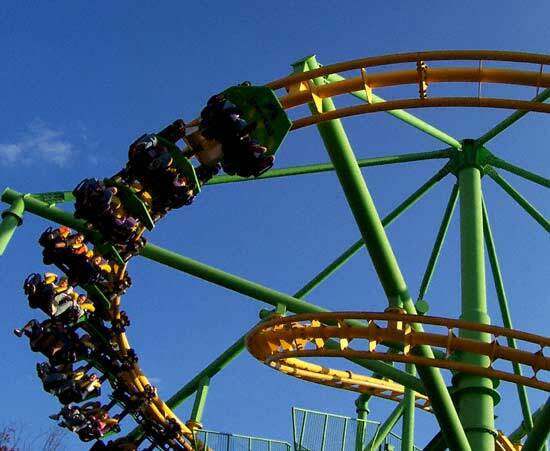 In addition to the Parque Warner Madrid installation that debuted in 2002, Six Flags had installed 3 Giant Inverted Boomerang in 2001 as “Déjà Vu” at Six Flags Magic Mountain (Santa Clarita, CA), Six Flags Over Georgia (Austell, GA) and Six Flags Great America (Gurnee, IL). 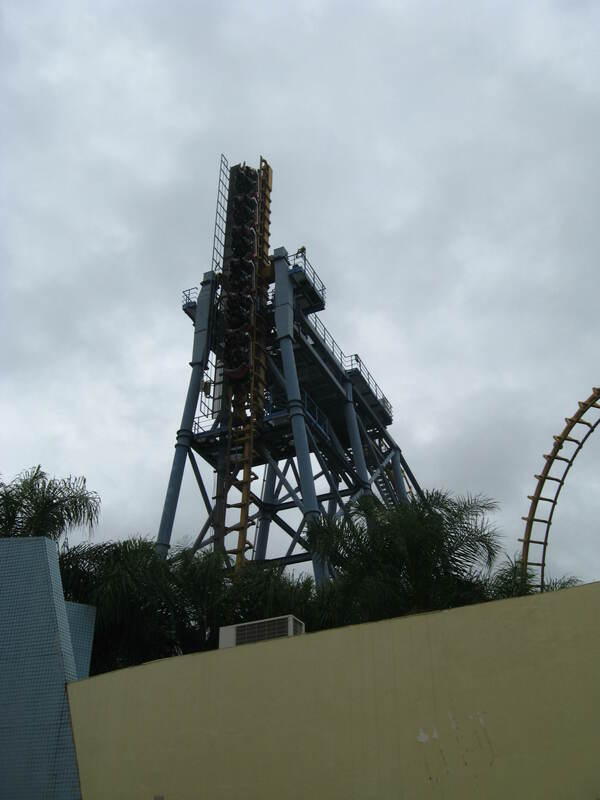 The Six Flags Over Georgia is still waiting installation in Brazil after being sold by Six Flags. Stunt Fall at Parque Warner Madrid. Photo by Flex. The train was the last innovation for that ride. 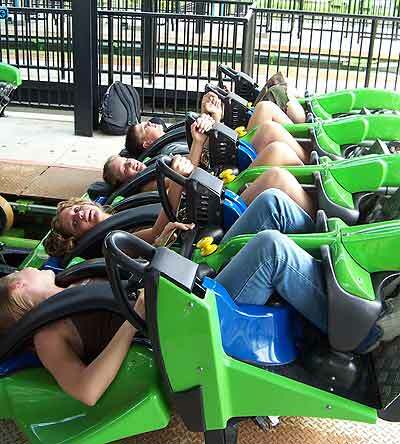 In order to give a unique ride experience, Vekoma designed a train with 8 cars and a strange seating configuration. Two of the seats are forward and paired together in the middle. The two other seats are single and a bit further back, with one on each side. The end result is a tight V shaped. 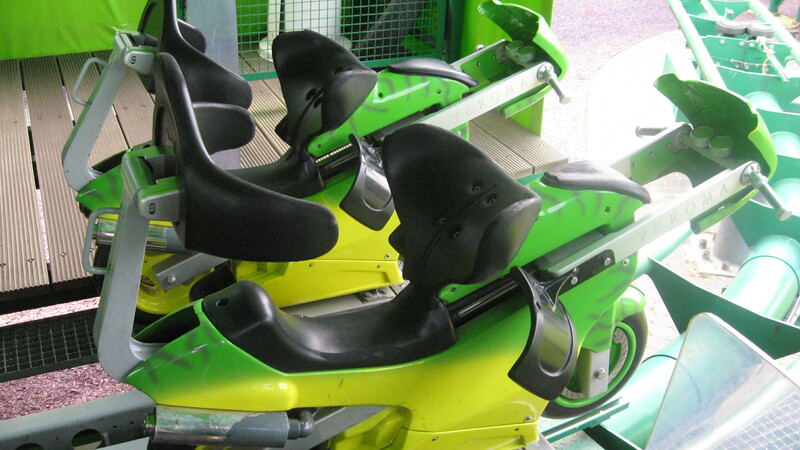 The shoulder restraint was new, but Six Flags modified them to add an extra bar around rider’s breast area, an extra bar to keep rider’s arms down and a second waist seat belt. 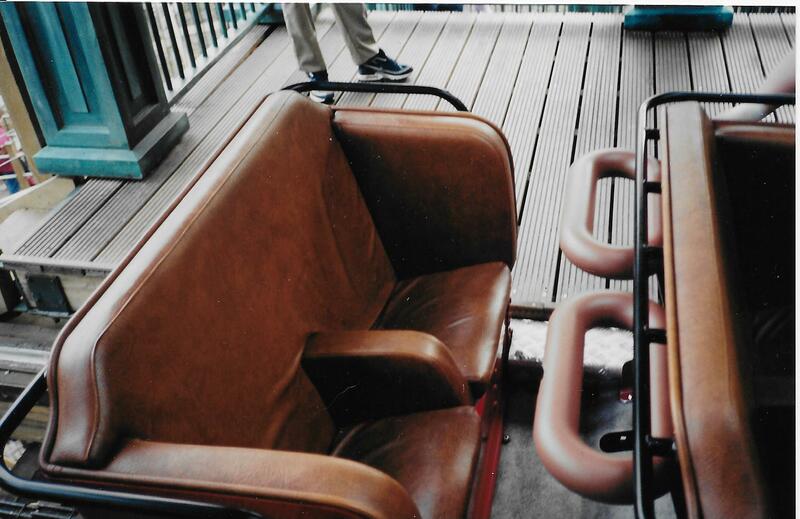 The “Wing” seat on the Giant Inverted Boomerang. Photo appear courtesy of Flex. 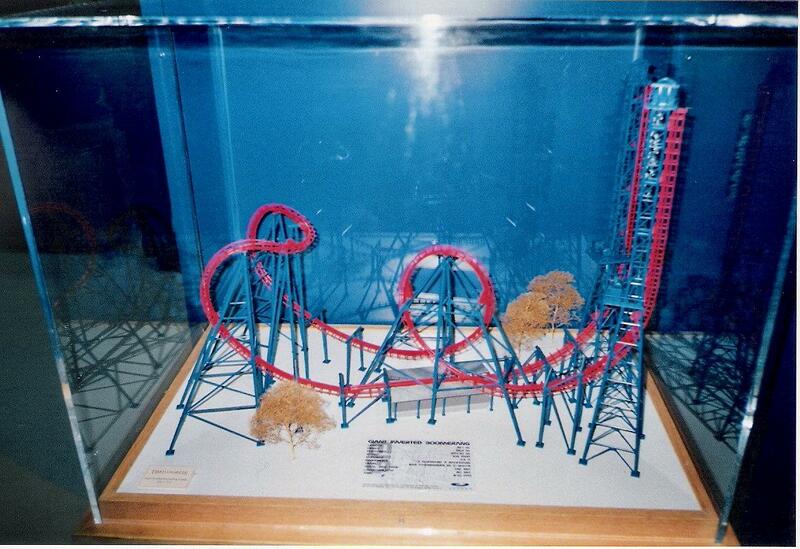 The second product to debut that year was the Tilt Coaster. It is a very unique experience that has so far been ordered by only one park, Discovery World at Lihpao Land in Taichung, Taiwan. 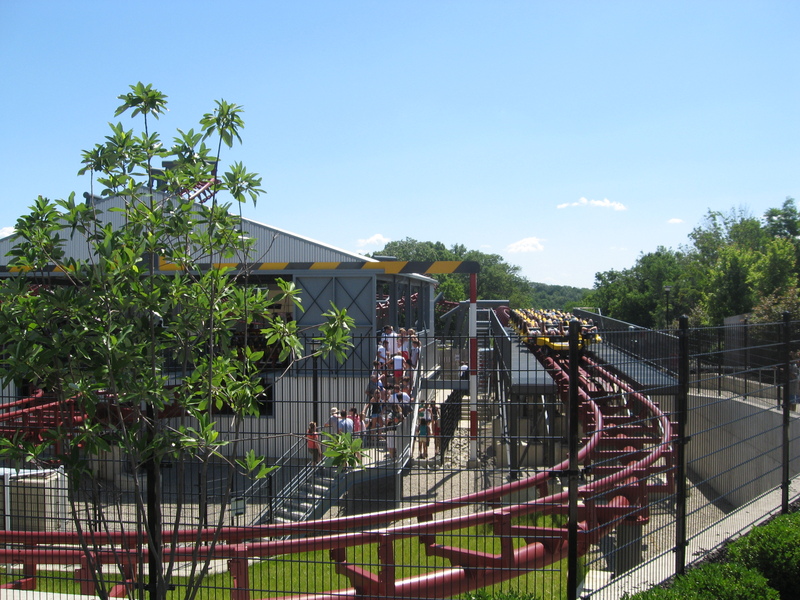 Known there as Gravity Max, the ride was completed in 2001, but the park only opened in 2002. The ride itself is very simple: after a steep 45 degrees 114 feet tall lift hill, the train rolls on a flat track section and is then stopped. At that point, a metal block raise in front of the first car chassis, the pneumatic pinch brakes grab the train and a metal hook attach itself to the back car, similar to a Boomerang. Once all 3 safeties are engaged, the track… moves. The huge track section tilts forward until it is lined at a 90 degrees angle with the drop track. Once the track is in the proper position, the steel block slides down, the hook disengage and finally the brakes open. The train drop down the vertical drop in what can be called a face down freefall, goes under the walkway and around a banked curve. It powers through a 88 feet tall loop that wraps itself around the waiting line/exit bridge and then goes around a Bayern Curve. The train is then stopped in the final brakes. The view of the ride from the ride entrance plaza. Interestingly, when the platform start moving, everyone stop in their tracks and gasp at the ride! 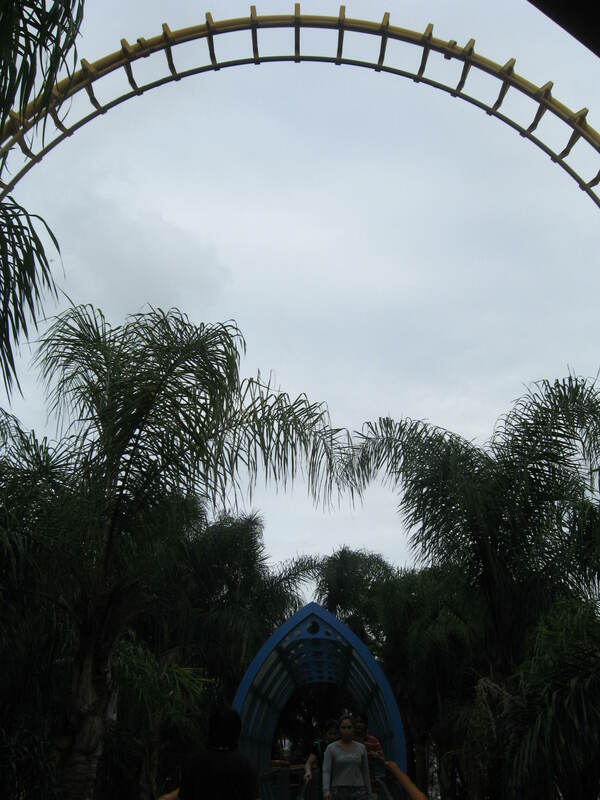 The ride exit and entrance bridge. The loop is wrapped around it, similar to French Revolution. The MK-1211 train is very comfortable and track very well, even in the tight curve after the drop. The attachment that the hook attach itself to on the platform. 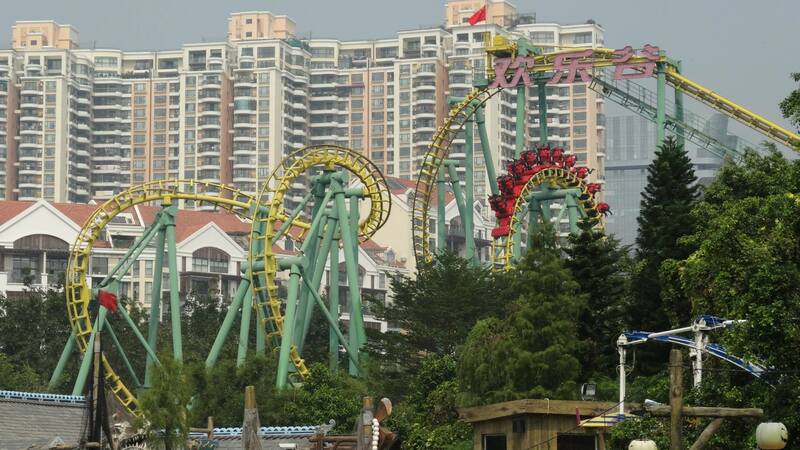 To provide a better view, Vekoma designed a new train for this ride. Known as a MK-1211 train, it has a very open design and a more comfortable shoulder restraint. Those 3 pictures show the tilting sequence. I was very lucky to experience this ride in 2010 and my opinion on this is simple: the greatest ride experience in the world. 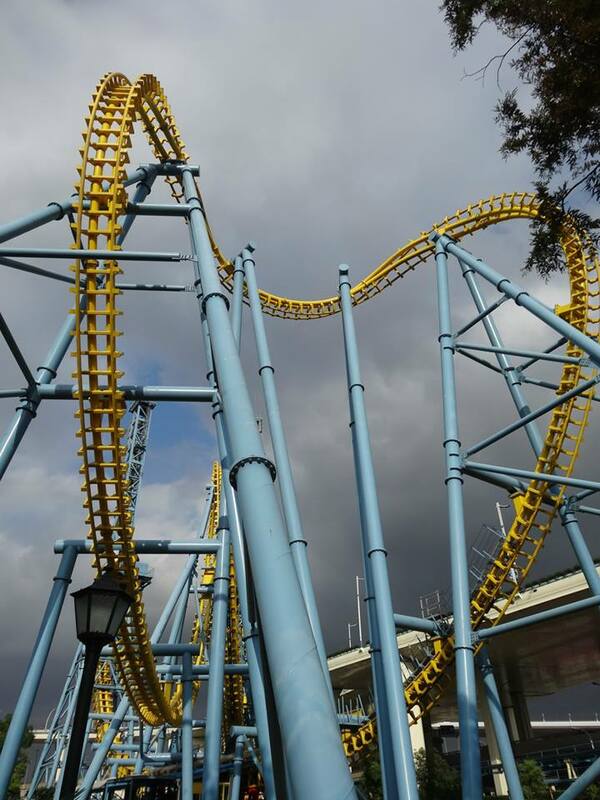 Nothing can beat the pure terror and fear when the track tilts and then, the greatest drop in the world when you’re released. The last new product was the Suspended Family Coaster. The first two were sold to Paramount Parks who placed them at Kings Island (Mason, OH) and Canada’s Wonderland (Vaughan, ON). The ride features a compact 1122 feet long layout and a tire driven 49 feet tall lift hill. The single train has 10 cars with two riders in a row that are secured by a small shoulder restraint. The ride was popular and Paramount purchasing a 3rd one for Carowinds and parks in Australia (Dreamworld in Gold Coast) and three other American parks buying them as well. 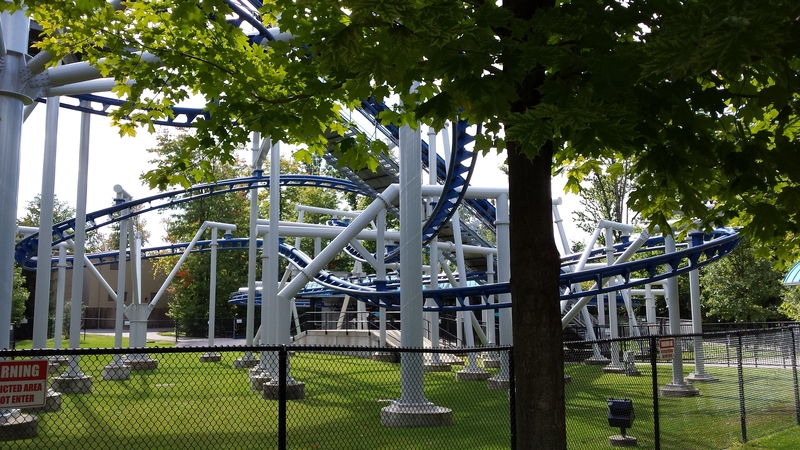 Silver Streak at Canada’s Wonderland (Vaughan, ON). This is one of the two prototypes that opened in 2001. Photo provided by Jordan May. The train coming off the lift hill. 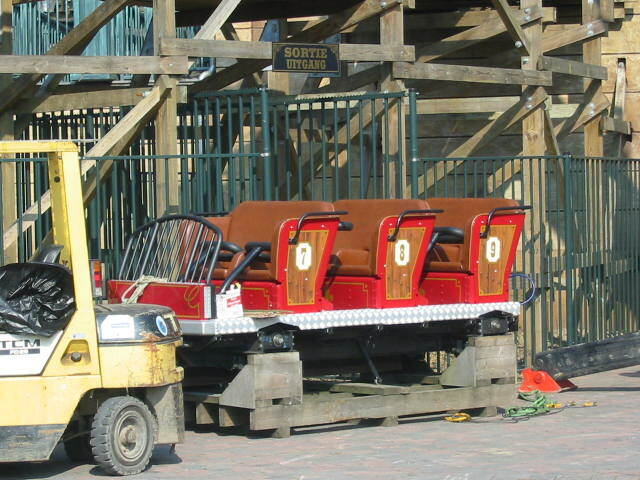 The original train used on the Family Suspended Coaster. The above 3 photos appear courtesy of www.negative-g.com . 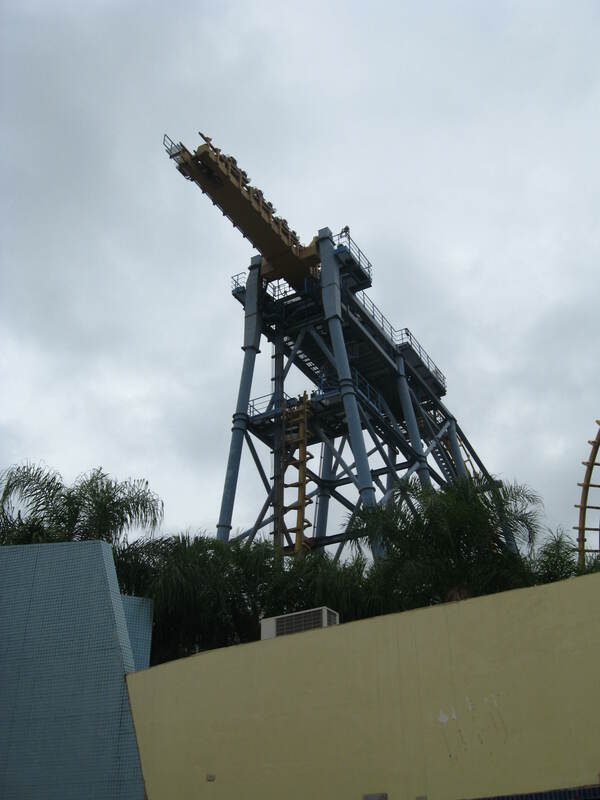 The Flying Coaster was evolved, with two new models appearing as the Batwing at Six Flags America (Largo, MD) and X-Flight at Six Flags World of Adventure (later renamed Geauga Lake in Aurora, OH). 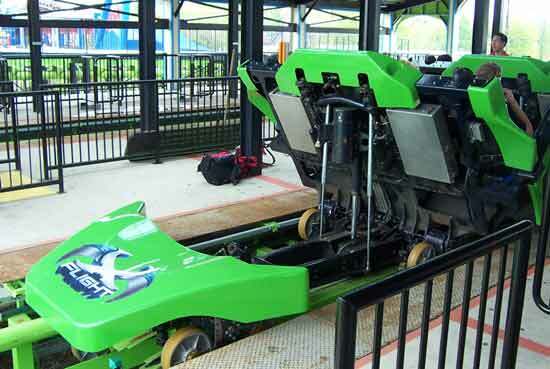 Vekoma delivered them with the original on-board hydraulics and a split station patterned after the one on Space Mountain (Disneyland Paris) was integrated into the layout. 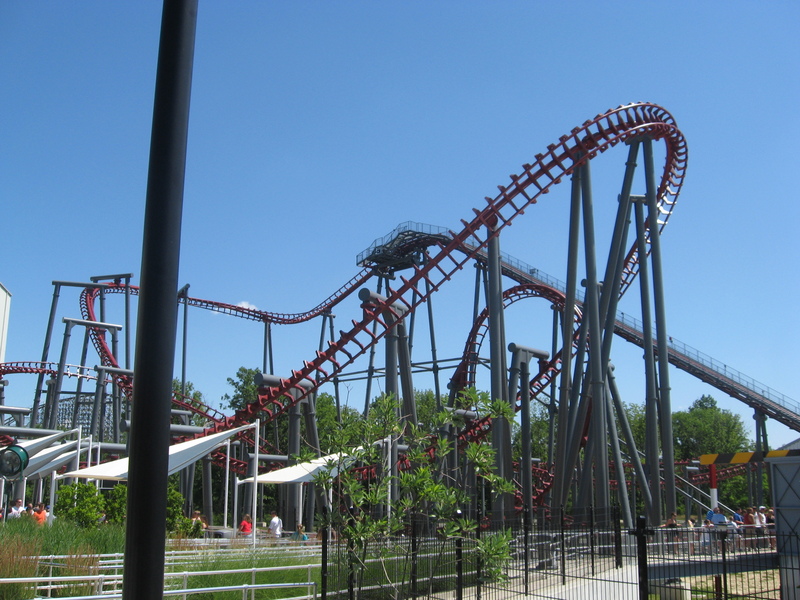 That layout was also modified to have a longer “Flying” portion at the end when the double Corkscrew was turned to a double barrel roll and a Bayern curve added before the final brakes. It was originally set to run 3 trains, but both parks were never able to efficiently. X-Flight layout from the front of the ride. The car in the ready position. 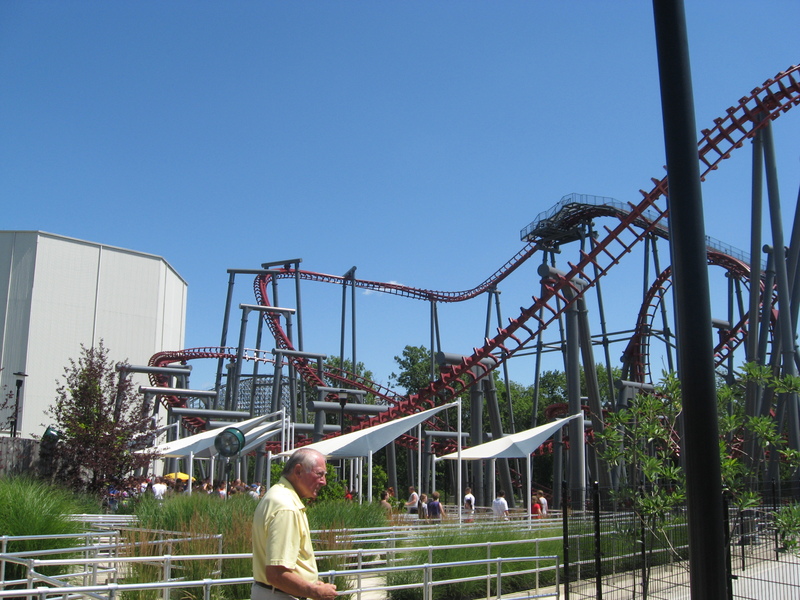 In 2007, Cedar Fair moved X-Flight to Kings Island (Mason, OH) and renamed it Firehawk. It was repainted with dark red track and charcoal supports. Two trains were rebuilt and the on-board hydraulics removed. The same station hydraulics as Stealth was installed and wheels mounted on the side of the cars to work with those. The lift and first drop. 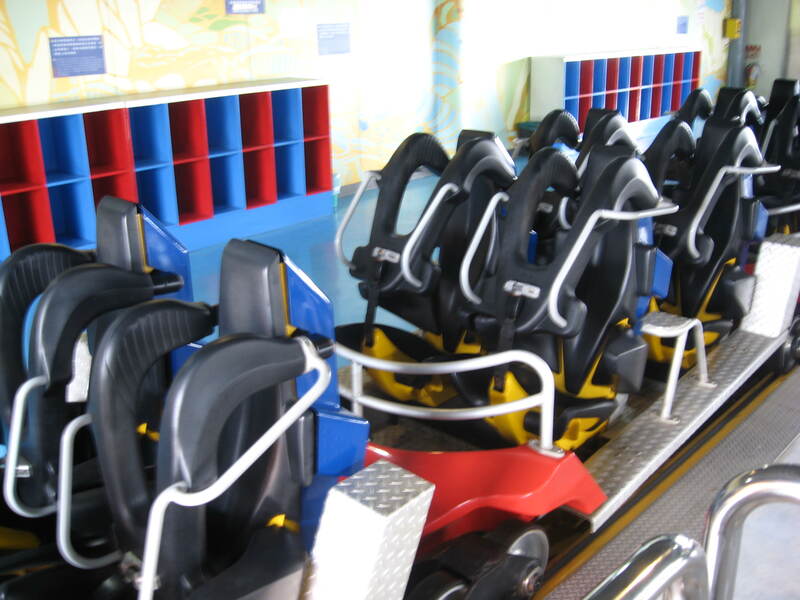 In 2002, Vekoma introduced two new Suspended Looping Coasters, each featuring a custom layout. The first one to open was “Shenlin” or as the Chinese name translates to English, Snow Mountain Flying Dragon. It opened at Happy Valley in Shenzhen, China and feature a more spread out layout than the traditional SLC and its myriad of variations. The layout here start with a 118 feet tall lift hill that lead to a spiraling 270 degrees 112 feet drop. The train execute a 87 feet tall loop, a 75 feet tall Cobra Roll and then a 55 feet tall Zero G Roll, the first ever on a Vekoma coaster. The ride concludes with an inclined Bayern curve which leads into the brake run. 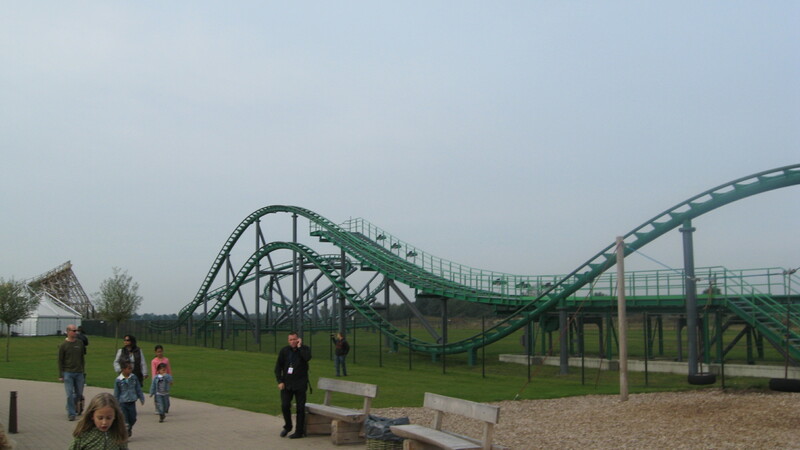 This particular installation is nicknamed the “Shenlin” layout and Flamingoland in Malton, UK ordered a clone in 2006, where it operates as Kumali. 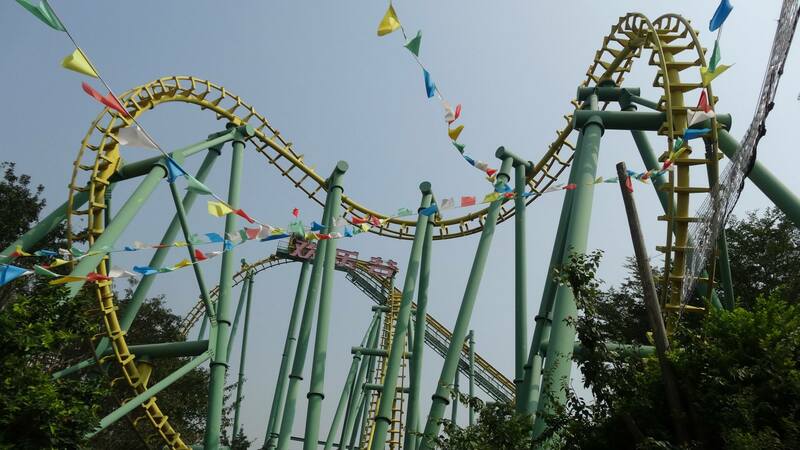 Happy Valley group ordered two more “Shenlin” for their Beijing and Changdu parks, but those feature an extended layout with an extra raising flat helix before the brake run. The Cobra Roll on Snow Mountain Flying Dragon. The loop with its unique support structure. You can see most of the layout in this picture. The three pictures appear courtesy of Flex. The second custom SLC to open that year was the Jubilee Odyssey at Fantasy Island. Located in Ingoldmells, UK, this unusual park is built around a giant flea market. A large custom MK-1200 Vekoma Looping Coaster encircles the market and in 2002, in honor of her Queen’s Elizabeth II Golden Jubilee, the park opened a new Inverted roller coaster. Standing 167 feet tall, it was the second tallest full circuit Inverted coaster in the world when it opened. After the steep 60 degrees 141 feet first drop, the ride single train reach 63mph and goes through a 124 feet vertical loop. It then goes through a Cobra Roll, a Horseshoe turn (similar to the Flying Coasters), a Sidewinder, a large 270 degrees turn and then a Corkscrew before the brake run. The 2924 feet layout is travelled at a brisk pace, but there were concerns with the train stalling in periods of high winds. So after the 2002 season, the Horseshoe, Sidewinder and turn were modified and lowered. The main modification to the ride design was the train. It went away from the Suspended design that used hydraulic cylinders to keep the carrier in place to a rigid carrier. That and a redesigned bogie assembly for the wheels minimize the roughness that sometimes affect the various SLC’s. 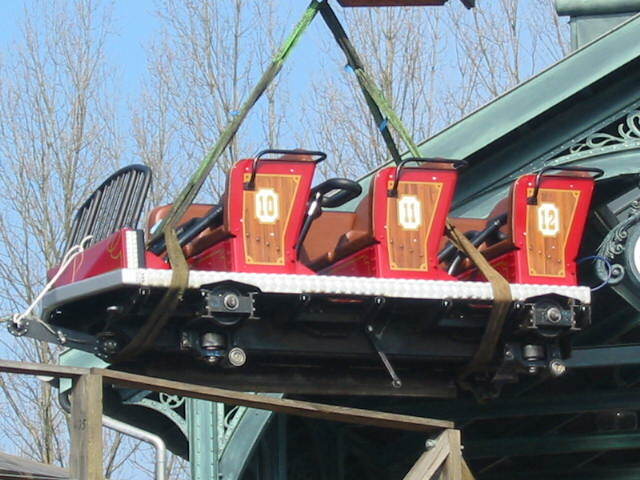 One further modification in 2005 was changing the restraints to go from the classic post 1995 design to the Giant Inverted Boomerang shoulder bars. 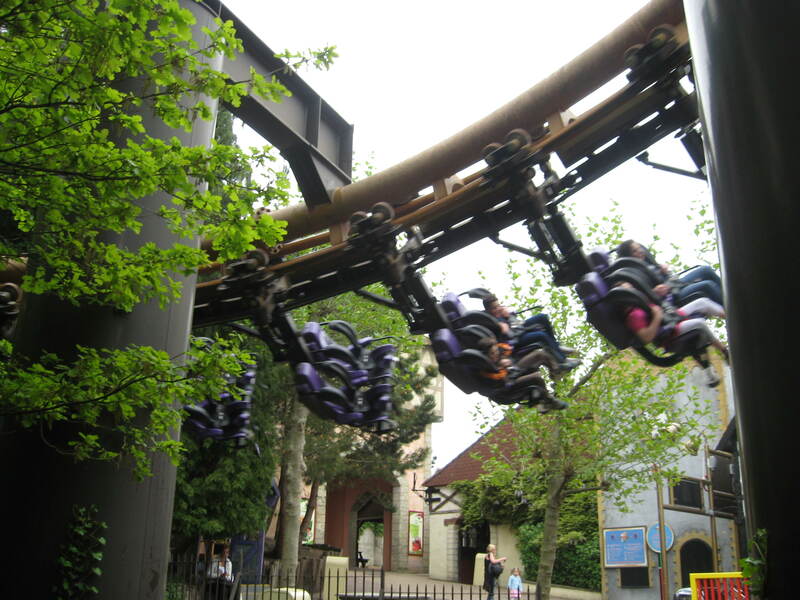 That same year, Chessington World of Adventure in Surrey, UK reopened their Vampire Suspended Roller Coaster. It opened in 1990 and was built by Arrow Dynamics. The 2200 feet long layout had two lifts and the finale involved a curved drop into a tunnel. After the 2000 season, the ride closed and throughout 2001, got a full renovation completed by Vekoma. 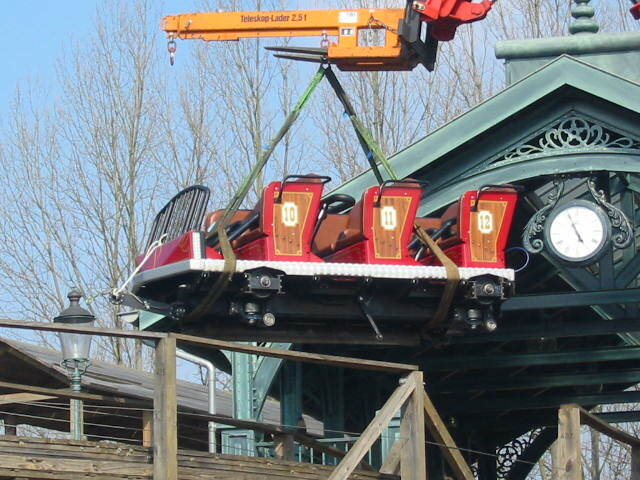 The 3 bat trains were replaced by new floorless swinging cars. Those cars are trailered and each car is composed of a single row, whereas the original trains had 7 cars with two rows each. So, capacity went down to 24 riders per train, but the longer trains caused a major modification: the old transfer table was too short. So, Vekoma welded the transfer table in place and fabricated a new track loop. That loop goes from right behind the station to the existing transfer track with two rotating track switches used to connect. The new cars have a bigger envelope, so the park dug up the tunnel and poured new concrete in order to secure the foundations there. The trim brakes before lift 2 were adjusted, as the new trains were coming in too fast. It worked and the ride got a new lease on life, still operating in 2015. The Vampire swinging in Transylvania. Booster Bike opened in 2004 at Toverland in Sevenum, Netherlands. This unique roller coaster is a revival of a long extinct genre: the Steeplechase roller coasters. Originally conceived at the park of the same name in New York City, this unique ride had riders sitting on large horses that were similar to their Carousel siblings. It gave a complete sense of vulnerability and unfortunately, the last of the original ones closed in 1964. In 1976 and 1977, Arrow Development developed a new version, where the 1976 installation at Knott’s Berry Farm (Buena Park, CA) featured four parallel tracks and pairs of riders sat on large motorcycles. That installation, after getting converted to “Soapbox Racers” closed in 1995. The 1977 one still operates at Pleasure Beach in Blackpool, UK. This one has 3 tracks. 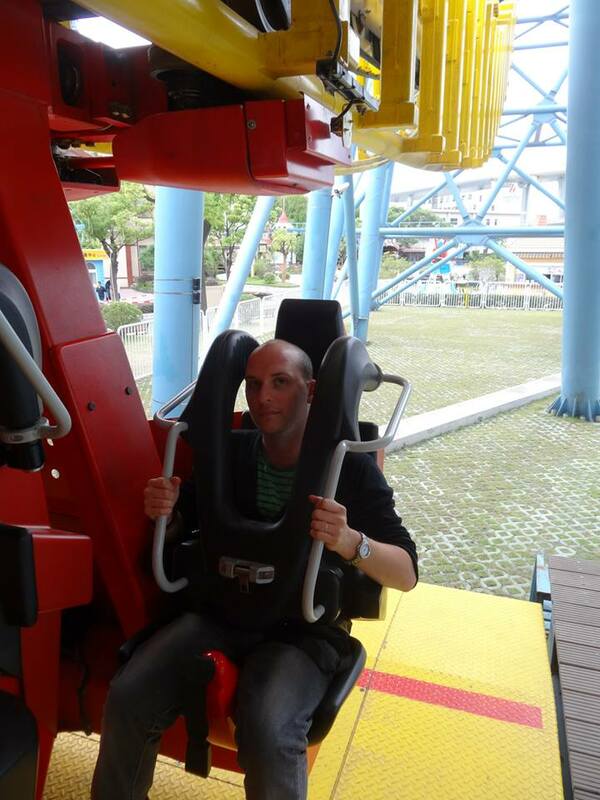 So, Vekoma fixed two issues: safety and capacity. Safety was the main one to overcome, as riders were subject to unusual forces and with only a seatbelt to hold you in, it made most parks nervous and lead to the motorcycles retirements at Knott’s. For capacity, two motorcycles would be installed side by side in each car and the train would consist of 8 cars. You can see the return hill and catapult in this picture. The banked curve leading into the station. Now, motorcycles usually feature sharp accelerations, so the ride was designed to include a new Hydraulic launch catapult that would shoot our motorcycle convoy from 0 to 46 mph in 3 seconds. Wide swooping turns and drops were included in the 1969 feet long layout. The motorcycle itself force riders in a crouched position and when riders pull the handles, a back rest move forward and restrain riders in the optimal position. 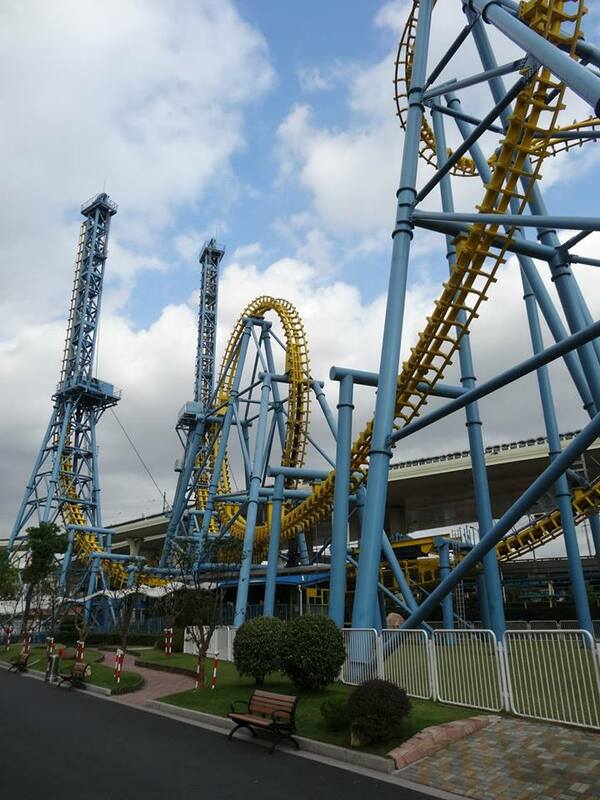 Motorbike Launch Coaster at Chimelong Paradise in Guangzhou, China. 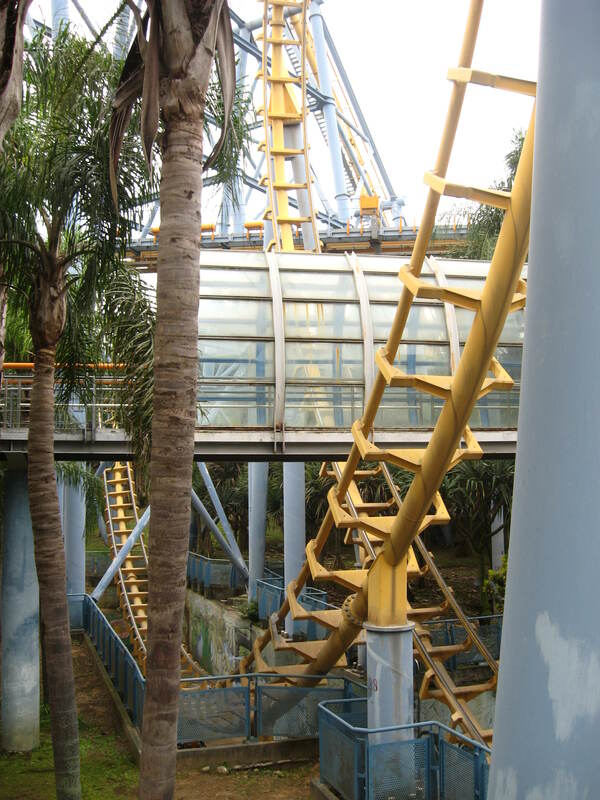 It is similar to the prototype ride and opened in 2006. The train is cresting the first hill. 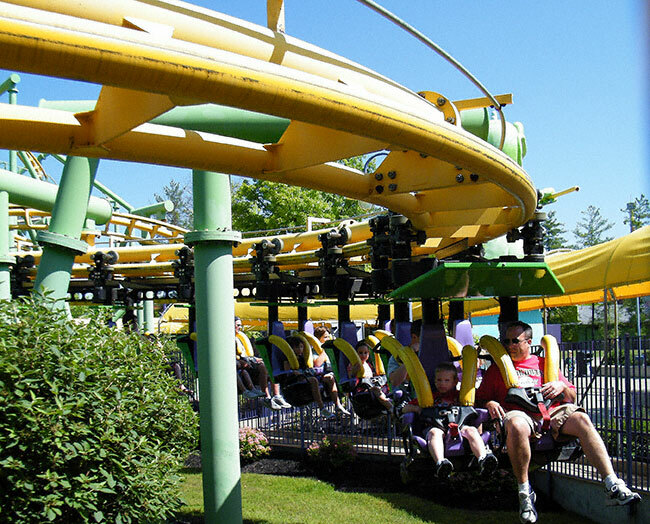 The ride is known today as a Motorcycle Coaster in the Vekoma catalog, with both a standard layout (the Booster Bike) and custom installations offered. 5 were sold to date, with a possible 6th to come in 2015-2016. 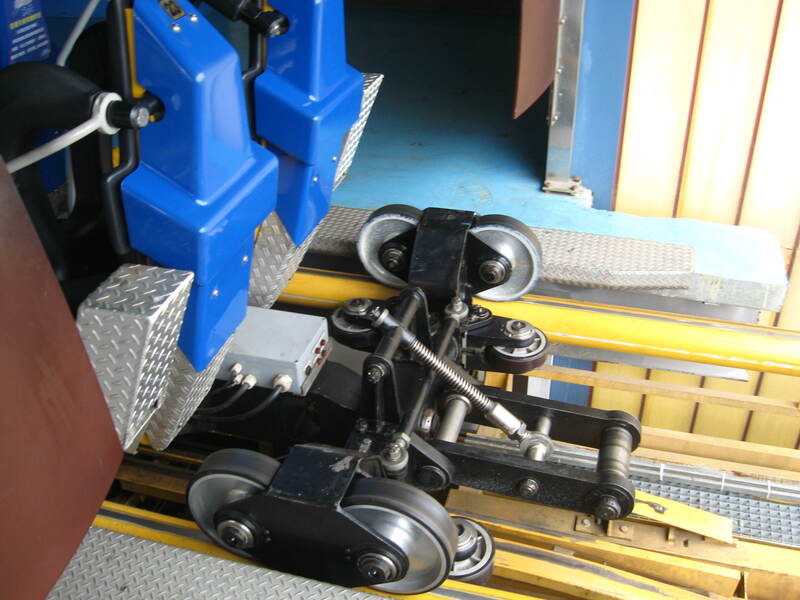 Both installations were the first Vekoma rides to be delivered with Eddy-Current Magnetic brakes. On both rides, they are used to trim most of the speed at the end and the regular pneumatic brake calipers stop the train and hold it in place. 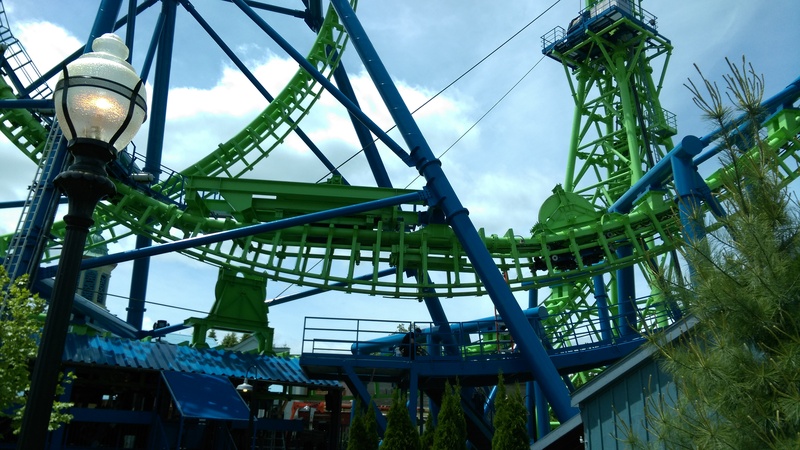 This entry was posted in Coasters, Industry Profile and tagged deja vu, Firehawk, giant inverted boomerang, gravity max, Jin Jiang Action Park, Kings Island, motorycle coaster, six flags, Stunt Fall, tilt coaster, Toverland, Universal Studios Singapore, Vampire roller coaster, Vekoma, X-Flight. Bookmark the permalink.